Did I mention Google AdWords is FAST! Start a Google AdWords campaign today and see results tomorrow. The speed and targeting flexibility allows you to get your advertisements in front of the right customer, during a period when the customer is deciding on service providers. Google calls this the “Zero Moment of Truth” or ZMOT. This moment is defined as the exact moment when someone decides to engage with your company or not. If your company isn’t present in this ZMOT phase, then…well, you know the answer. Thus, incremental sales improve as you’re able to present the right offer at the right moment to the right customer. You decide on how much you want to spend each month. This budget can go up, down, or stay the same depending on how busy you are. This control gives you peace of mind, no surprise advertising costs. Your accountant and your bottom line will love you. Building organic trust to your website through traditional SEO tactics should be part of your overall marketing strategy. The major challenge is the exorbitant cost and it’s painfully slow. Aside from this, your goal should be to have visibility in both organic results (using traditional SEO methods) and the paid advertisement section on a Google search results page. Why? Customers use both interchangeably, thus you need to be visible in both locations. 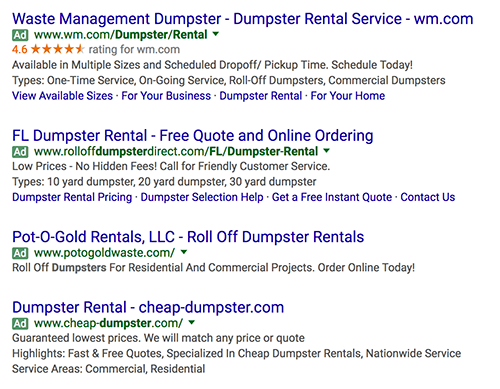 Your competitors may be using Google AdWords today and taking potential customers away, the good news, most are probably not. This is also a great opportunity for you to level the competitive playing field with competitors currently using AdWords and beating out competitors who are not. Another good reason, Google AdWords allows you to compete evenly with the “big outfits” in your area. You know these companies well; they seem to be everywhere. Many businesses have set up their own AdWords campaign in the past with great success. Today, the Google AdWords platform is daunting, there are many ways to set up a campaign for success. Alternatively, there are many ways to set up a campaign that erodes budgets quickly with marginal results. The platform is an awesome tool to get the desired results, but to the novice user, it can be challenging. Let an expert manage your AdWords campaign and continue doing what you do best, running your business. In summary, you may offer the best service, the best price, and ultimately the best customer value, but if potential customers cannot find you then being “the best” really doesn’t matter.